The Indian saree is as old as India’s civilization. Even the holy text of Mahabharata mentions an incident about Draupadi’s saree and how it changed the course of history. Coming back to the current times, saree still remains an important part of our culture. One can see various different ways of draping a saree in various different parts of this vast and culturally diverse country. In this post, we will talk about the madisar saree of the Brahmins in Tamil Nadu. 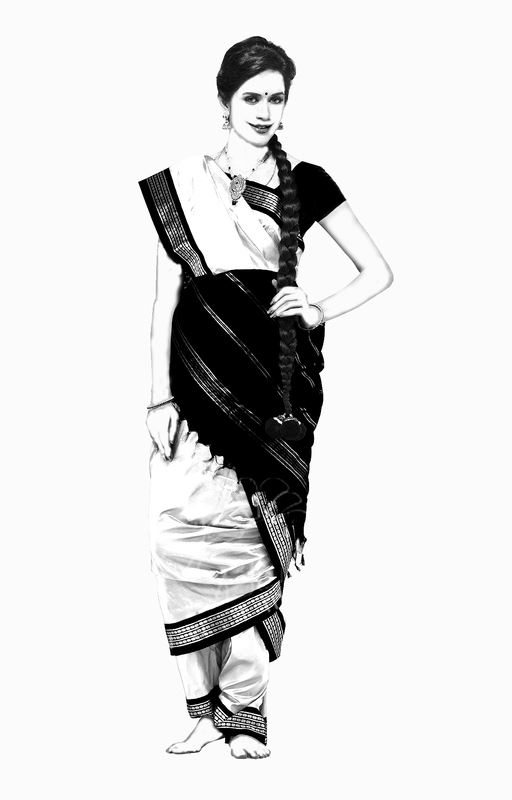 Madisar saree is the traditional wear of Brahmin women in Tamil Nadu. A saree is called a pudavai in Tamil, so madisar saree becomes madisar pudavai. It is worn by married Gurukkal, Iyer and Iyyengar Brahmin ladies, especially on important occasions like marriage, Seemandham (a function for pregnant women), poojas and death ceremonies. It is a long saree (usually 9 yards) that is wrapped around the body and legs in a very peculiar way. It looks like pallu over your chest, followed by knee-length skirt, followed by multi-pleated pants till your ankles. I know it sounds confusing, so wait till I explain the procedure of draping it around your body. It’s not too difficult. Wear a blouse but skip the petticoat, as the saree will be tied in trouser style. You can wear stretchable three-fourths or jeans inside if you wish. Take these small pleats (or bunch of folds) to the left side of your back and hold them firmly in place. Spin the saree around your body, run it over the pleats an inch below the fold-tips, then bring the running end of the saree to the front to your navel. 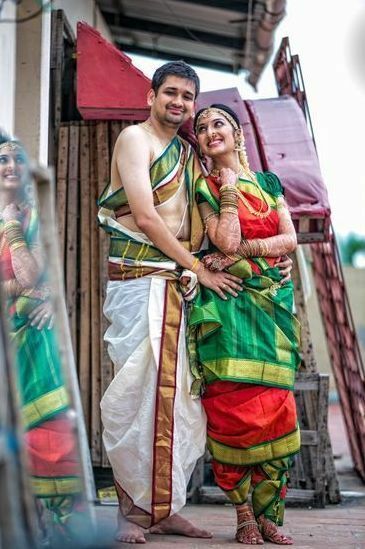 Take an inch of the saree on your right (it will borrow some length from the pleats in your back) and an inch from the left and tie a double knot at your navel. The knot shouldn’t be too tight, but should hold the saree in place all day long. We were wrapping the saree in a clockwise direction till now (from left to right). Now take a foot-long length of the untied saree and change direction of the wrap. Take this foot-long length back to your left side and tuck it. Change direction of the wrap again to clockwise, run the saree along your abdomen and tuck again to your right. Now let the remaining untied saree fall along the front. Place your feet apart and push this falling, untied saree from between your legs to the back. This length of the saree that runs between your legs and gets tucked behind is called kaccham. Tuck the kaccham firmly at your waistline in the back. This would make the pleated pants’ shape around your legs. Take another foot-long length of the untied saree at your back, go anti-clockwise from kaccham to your right and tuck it there. Change direction to clockwise again and run the saree along your back from right to left and bring it to the front (that’s one clockwise spin). Extend the breadth of the saree over your right knee, so it would look like an oblique line because left knee is not covered in this wrap. Pin the pallu to your blouse at the shoulder. Take one edge of the pallu that falls in the back, spin it clockwise around you, and tuck it to your right at the waistline. Viola! So now, the saree drapes over your chest and right shoulder, covers your back completely, makes a knee-length skirt of sorts, with an inverted V around your legs like a multi-pleated pant.